Here is a little wrap up of Rascasone's 2018 year. Altogether we worked on 23 software or startup projects. 18 commercial ones for clients, 5 internal projects focusing on tools or internal ideas for new products. React became very popular and useful so we are happy to help clients make their products faster and more user-friendly. 47% of all our projects were written in Ruby on Rails. These were mostly full stack website projects or backend APIs. We like Ruby on Rails a lot so there is no reason not to use it. 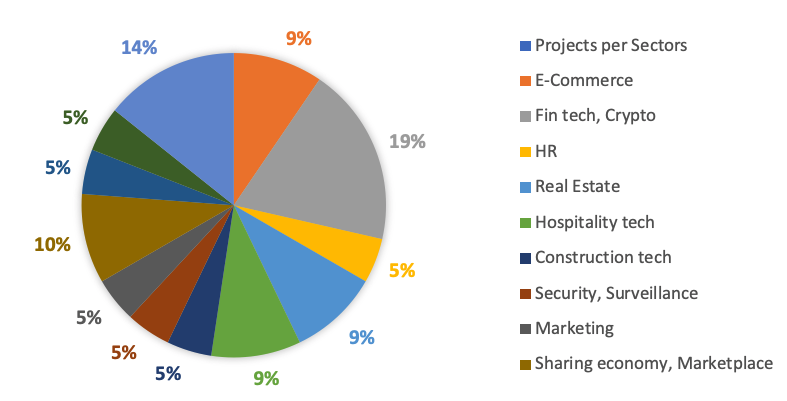 Most of our projects, 19% from all of them to be precise, came from fin-tech and cryptocurrencies sectors. They covered products dealing with bitcoins, trading, financial products, insurance, and financial reporting. The second biggest group represents projects from the area of sharing economy and marketplaces. Other sectors included e-commerce, human resources, real estates, hospitality tech, construction tech, security and surveillance, and marketing. We use Toggl to track all our work. This is how the tracked time looked like during the year.